City buses, or transit buses, are types of buses used for servicing short to medium distance trips. Typically a part of a publicly scheduled bus service network, city buses are designed to maximize capacity for rush-hour demands and are therefore equipped with simple benches or bucket seats without additional luggage spaces. With built-in features that usually include multiple doors, pull cords or stop request buttons, passenger information systems, and low-floor technology for greater accessibility, city buses are designed for safe, efficient, and equal public access. 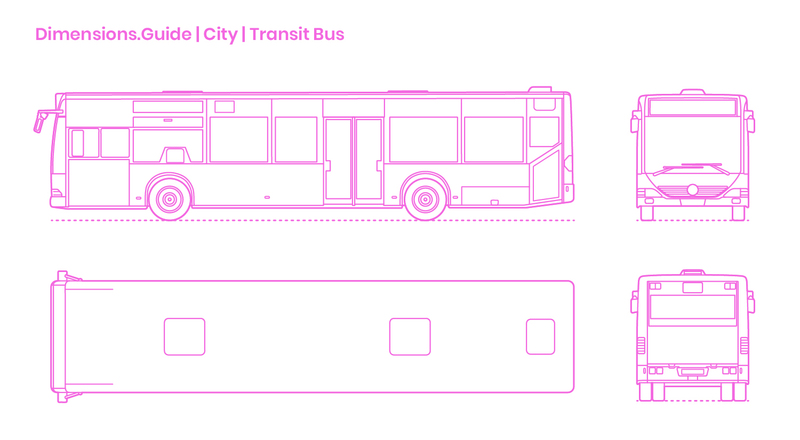 City | Transit Buses have average lengths of 39’2” | 11.95 m, widths of 8’4” | 2.55 m, heights of 9’10” | 2.99 m, and have a capacity of 29 (+1) seats with standing room for 76.